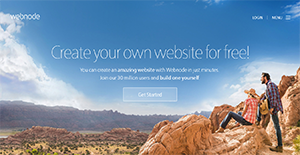 Webnode is a cloud-hosted platform that allows you to easily build professional and engaging websites. It boasts of simplicity, ease of use, and several affordable plans that don’t require any start-up cost. It is ideal for individuals, professionals and businesses looking for a software to help them create a blog or website complete with tools like analytics tools and design templates. Webnode can help you come up with a custom domain name, and get one tucked in for free in a year through its premium package. If you have an existing domain, Webnode can transfer it to your new site. The software also brings with it advanced SEO capabilities to optimize your website, enhance your site’s online visibility, and help you attract more targeted visitors and customers. Webnode does not require an upfront fee, allowing you to quickly create and publish blogs and websites at the onset and transition to a paid plan later. It provides a cost effective solution especially for startups and small businesses. No prior technical knowledge on web development or coding is required to sue the software. You can get your website up and running in minutes after you open your account. This is made possible with pre-built design templates that you can easily configure to carry your brand and corporate elements. Although free websites cannot have their own custom domain, those that purchase the limited plan can apply their unique domain name if they have a pre-existing one. Meanwhile, users that choose other premium plans get their own domain free for one year. Having a domain makes businesses and service providers appear more professional to their customers and potential clients. It also makes recognition and remembrance easier. Webnode has multi-language capability which means you can build websites in different international languages for a truly global reach and localization with particular geographies. This way, nothing is lost in translation and your local customers can better understand your services and products. Webnode offers site SEO so you can implement optimization techniques to make your website more visible and well-ranked in search engines. You’ll be able to apply website tweaks to increase customer engagement and entice more visitors. If you are considering Webnode it could also be sensible to investigate other subcategories of Best Blog Software listed in our database of B2B software reviews. Every enterprise has different requirements and requires a software that can be personalized for their size, type of employees and customers, and the specific industry they are in. For these reasons, no software can offer perfect functionality off-the-shelf. When you search a software product, first be sure what you require it for. Read some Webnode reviews and ask yourself do you want basic features or do you need sophisticated features? Are there any industry-specific features that you are searching for? Find the answers to these questions to assist your search. There are lots of factors that you need to consider and these include your finances, specific business requirements, your company size, integration needs etc. Take your time, use a few free trials, and finally zero in on the platform that offers all that you require to enhance your organization competence and productivity. How Much Does Webnode Cost? We realize that when you make a decision to buy Blog Software it’s important not only to see how experts evaluate it in their reviews, but also to find out if the real people and companies that buy it are actually satisfied with the product. That’s why we’ve created our behavior-based Customer Satisfaction Algorithm™ that gathers customer reviews, comments and Webnode reviews across a wide range of social media sites. The data is then presented in an easy to digest form showing how many people had positive and negative experience with Webnode. With that information at hand you should be equipped to make an informed buying decision that you won’t regret. What are Webnode pricing details? What integrations are available for Webnode? Webnode integrates seamlessly with Google Analytics. If you need more information about Webnode or you simply have a question let us know what you need and we’ll forward your request directly to the vendor.